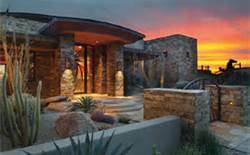 Million dollar homes in Tucson Arizona are once again gaining traction and showing increasing sales numbers. After 5 plus years of dismal sales, million dollar home sales are rising. Many buyers are coming from California, where a small two story with detached garage can go for well over a million. With a glimpse of the ocean, the price is even higher. In March, 2015, a 1,000 sq. ft. fixer upper in La Jolla, California sold for just under $1 million. Yes, the Pacific could be seen from the second story bedroom. The million dollar homes market segment in Tucson is benefiting from the economic and environmental challenges in California. Selling a multi-million dollar home in California and spending a million in Tucson is making more and more sense to a lot of people. Plus, there will be money left over to enjoy everything Tucson Arizona has to offer. The City of Tucson sits in the Sonoran Desert and surrounded by five mountain ranges. This unique setting has created opportunities for builders of million dollar homes to provide homeowners spectacular mountain and city light views. Views that are unmatched by any other city in Arizona. Now let’s not kid ourselves, while the sales of million dollar homes in Tucson is improving, buyers are still in control of this market segment. Most million-dollar homes are selling under the list price. Some significantly! The North area of Tucson is known as the Catalina Foothills. Why? Well, the area sits in the foothills of the Santa Catalina mountains just north of the City of Tucson. A million dollars in the North will buy you a home with large lots, great city lights views and the Tucson mountains as a backdrop. The northwest area is about 10 miles north of the City of Tucson. Many homes valued at a million dollars or more will be in Oro Valley and Dove Mountain. The Pusch Ridge view of the Santa Catalina mountains is a dramatic backdrop for homes in Oro Valley. Luxury homes valued at a million dollars or more are seeing increased sales. See the most recent monthly million dollar home sales update. The great thing about buying a million dollar home in Tucson is what you get for the money. A comparable home in Scottsdale AZ would be 3 to 5 times the price. Tucson has cooler temperatures, majestic sunsets, and a lot less traffic. Interested in a million dollar home in Tucson AZ as a year around home or winter retreat? We can help! We are a top Realtor team serving Tucson and its surrounding communities. Give us a call to discuss your interests in owning a home in Tucson – Oro Valley – Dove Mountain or another area – 520.940.4541.